I’m being stalked by hair loss clinics. At virtually every online turn I’ve taken in recent weeks I’ve been confronted by ads for companies promising a cure for something I don’t think needs curing. Normally Google is terrifyingly brilliant at reading my mind and listening to my conversations before targeting me with ads for things it thinks I’ll like, but its algorithms have been patchy of late and are directing me to surgical centres in eastern Europe which promise to move bits of my scalp from the back of my head to the front and sell me potions which will – they say – give me luscious hair. While I am – obviously – delighted his hairline is making this man with a weirdly poor command of his mother tongue “Soooo happy” it’s not for me. Hair is not something that has troubled me greatly since the early part of this century when I cut my losses and shaved my head in a Shannon hotel room on the night before I boarded an Aeroflot flight to Havana. But before that moment – which sounds more exotic than it was – it was a different story. 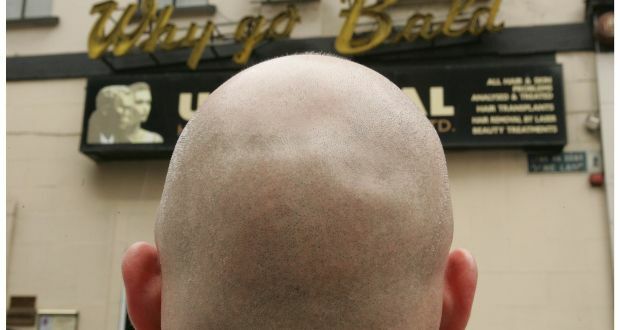 A fear of hair loss consumed me from the age of eight when I overheard my parents talking about a neighbour who had gone bald overnight after the authorities swooped on his house, built without the requisite planning permission and threatened to knock it. Despite an absence of major conveyancing issues on my horizon, the notion that such a thing could happen to anyone scared the eight-year-old me witless and I was convinced I’d wake up bald. I didn’t. At least not then. In my early 20s, I developed what I told myself was a widow’s peak and comforted myself with the thought that James Dean had one. And Morrissey. And some bloke from Beverly Hills, 90210 whose name I never knew. Everything was grand until a hairdresser – the kind of man you’d imagine would relish spilling the beans on Santa to a small child – told me I’d not be making too many more visits to him thanks to my “girl’s hair on top”. I’m pretty sure that’s not a thing.